Bus from Mersing to Kuala Terengganu is the most convenient bus route for tourists and travellers who like to hop from one island to another island. They rely on express bus service from Mersing, a gateway to Tioman Island, to Kuala Terengganu, a gateway to Perhentian Island and Redang Island. Transnasional is the only bus operator serving bus from Mersing to Kuala Terengganu. Transnasional is the leader in the express bus industry in Malaysia with its safe, enjoyable, and affordable transport service for passengers. Transnasional provides only 2 daily departures, which are in the morning 11:30am and at night 11:30pm. The bus fare for bus from Mersing to Kuala Terengganu is at RM 37.40 for adult and at RM 28.10 for child. Duration required for bus from Mersing to Kuala Terengganu takes about 6.5 hours, depending on traffic and weather condition on the departure day. Transnasional is serving this bus route with VIP bus which has spacious seat for passengers. The boarding point for bus from Mersing to Kuala Terengganu is Terminal Bas Baru Mersing. The Terminal Bas Baru Mersing is just about 5-minute-walk away from the jetty serving ferry service to Tioman Island. The arrival point for route is at MBKT Bus Terminal. Passengers arriving at Terminal Bus MBKT can take taxi to Shahbandar Jetty or Merang Jetty for boat service to Perhentian Island and Redang Island. Transnasional coach starts the trip from Larkin Terminal. 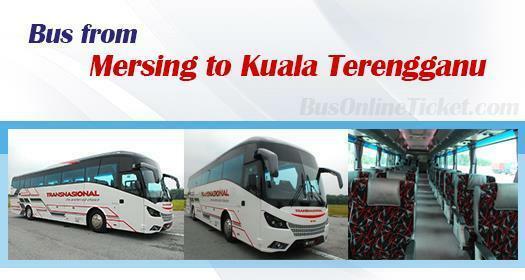 During the journey, the coach will enter Kota Tinggi Bus Terminal and Mersing Bus Terminal for picking up passengers. Therefore, the boarding time in Mersing Bus Terminal is just an estimation time. In the event the coach is late, kindly wait for the coach patiently especially the night time (Note: The counter close at 7pm). With limited bus schedules daily for bus from Mersing to Kuala Terengganu, passengers are advised to book bus ticket online in advance to prevent disappointment. You can book your bus ticket now with our official website BusOnlineTicket.com or via mobile app which can be downloaded for free on App Store or Google Play.